Ms. Kasama Mai has been touched by the power of forgiveness that she found in a women cooperative that she has been supporting to generate some income and allow them better lives. Turumwe meaning ‘we are one’, is made of 36 women who in fact have dramatically different backgrounds. Some are genocide survivors and others are the wives of genocide perpetrators. Despite this they work side by side, making soaps. Ms. Kasama said "I couldn't believe how people who were enemies could now live and share almost everything. It has touched my heart and challenged me because I am easily angered by nature". The women have been attending reconciliation workshops organized by an international NGO called REACH (Rehabilitation, Education and Community Health) which helped the women to forgive and live together despite the background. REACH has also provided financial support to the women to start a cooperative and do business. Ms. Kasama met Turumwe cooperative in Nyamata Bugesera district in September 2010. 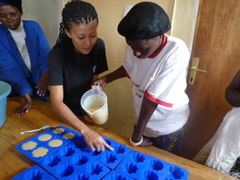 The women had started making soap, but they were not making enough profit. Lenia, who is in charge of accounting for Turumwe, said "We were really working hard, investing a lot of money and not gaining. The soap was made from palm oil and was not even viable." Ms. Kasama decided to propose a new method of working which gave good results. 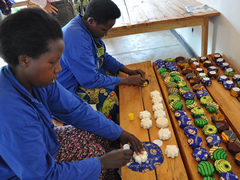 Turumwe began making rose-shaped soaps which are now being sold in Heaven Restaurant in Kiyovu, and souvenir shops around Kigali. A member of Turumwe, Mrs. Ziada, 64, also emphasized how things changed positively. "The difference is really significant. Now by the help of Kasama, we take some hours to make quality soaps. It is the only natural soap locally made from eucalyptus oil giving it a good smell; in the rose attractive shape". Ms Kasama said, "I am really proud to see the improvement they have made. They are organized and roles and responsibilities are clearly defined among the team. I am also happy that we could introduce a natural locally made soap to the Rwandan market". She and her colleagues at Turumwe have been enjoying the result and are confident of getting more business. 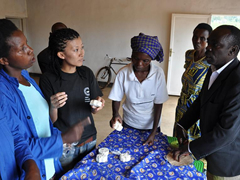 The Turumwe cooperative's new soaps were exhibited at the district trade fair, helping to cultivate more interest. And Ms. Kasama is working hard to help the cooperative access new markets such as supermarkets and hotels. She said, "We are looking forward to increasing our sales, targeting hotels having sauna and spa services because they got interested in the soap". Mrs. Ziada also said the cooperative is her only source of income. She manages to pay for school materials for her son who is still at secondary school, feed herself and pay someone to cultivate her field thanks to the cooperative. She said, "I gave these soaps to my son to use at school. Now he told me that all his friends want to buy and use it. This is a sign that our work will be more profitable". Mr. Manasee Sehirima, pastor of some women from the cooperative has been elected president of Turumwe. He says that since Ms. Kasama started working with them, the cooperative's success is inspiring the women to work hard to get more profit. Using the profits they have been able to buy goats for each member, providing fertilizer for their fields. He said, "We plan to extend the business, so we started making accessories such as necklaces, bracelets, earrings, etc and will soon introduce them to market. We also plan to have and train new members who are in need so they can improve their lives as we have improved". Before the end of her stay, Ms. Kasama wants to help the cooperative to work independently to ensure the sustainability of the business after she leaves. She will return to Japan in January 2012 after two years of volunteering. She said her experience in Rwanda has given her the desire to work hand in hand with local people, support and learn from them. Currently, 44 Japanese Volunteers are working in various fields such as education, rural community development and supporting youth activities across Rwanda through Japan International Cooperation Agency (JICA).